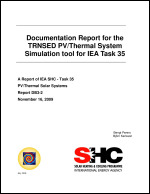 This report assesses availability of PV and Solar Thermal system models. 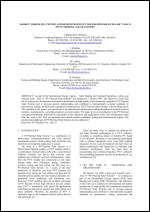 it is intended as a reference for those developing new models. 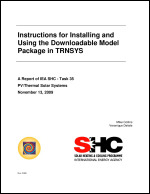 This document describes the new models and the modifications made to existing models, and provides instructions for installing the models contained in the downloadable package.The TRNSYS package is required to use these models. 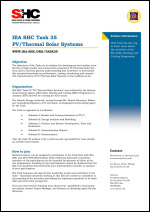 A simplified stand-alone package can be downloaded under Task 35 publications. 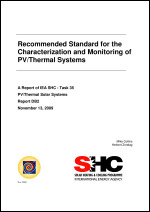 This report covers the proposed practice to characterize and monitor PV/Thermal systems, and identifies and addresses the gaps that currently exist in characterization and monitoring activities. 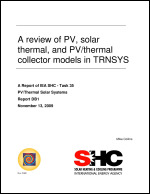 It details schemes for flat-plate style thermal collectors, but not PV/Thermal systems based on concentrating collectors. 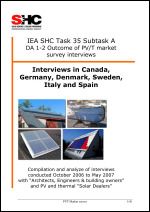 Summary of 65 interviews conducted in Canada, Denmark, Germany, Italy, Spain and Sweden. 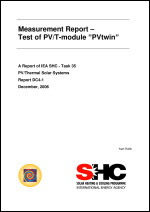 Measurement Report - Test of PV/T Module "PVtwin"
Report covers measurements taken at the Danish Technological Institute's outdoor test facility in Taastrup, Denmark in the period June-September 2006. 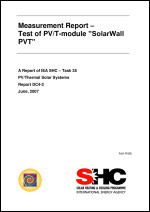 The results are valid for the tested prototype exclusively. 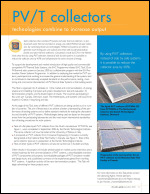 Article published in the IEA SHC Solar Update Newsletter, December 2006. 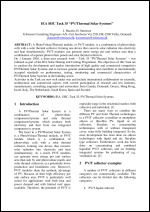 Paper on Task 35 and PV/Thermal Solar Systems from the World Renewable Energy Congress on August 19-25, 2006 in Firenze, Italy. 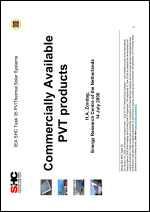 This document is an overview of commercially available PV/T products. 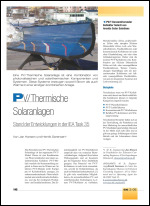 Article (in German) on Task 35 and PV/Thermal Solar Systems published in the Austrian Journal "erneuerbare energie".